The definitive GEORGE DIBBERN web site. Devoted to his life, family and friends; to his book, Quest; his ketch, Te Rapunga; his passport and flag; his biography, Dark Sun: Te Rapunga and the Quest of George Dibbern by Erika Grundmann. Included on this site are photos and information for which there wasn’t room in Dark Sun nor in Quest, or which I have acquired since publication of the books, as well as articles, reviews, newsletters, feedback, etc. 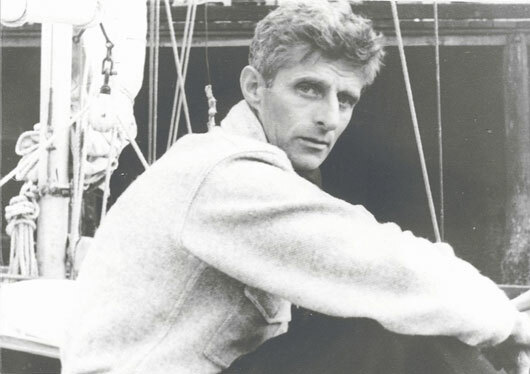 From 1993 till 2003, with the support of Dibbern’s family, I researched and documented the adventurous and committed life of George Dibbern, a fun-loving vagabond, visionary and controversial sailor-philosopher with views well ahead of his time. I examined what motivated him, the sacrifices he made and what became of the family he left behind in Germany. The ensuing biography, titled Dark Sun: Te Rapunga and the Quest of George Dibbern, is a timely and inspiring chronicle of what one man can accomplish when he thinks for himself and acts upon his convictions. My goal to bring about an affordable reprint of George Dibbern’s much sought-after book Quest has also been met. The process took several tries and in the end I self-published, but to see the new Quest take shape has been very rewarding. In addition, my long-held vision of a restoration of Dibbern’s ketch Te Rapunga is being realized! Twenty years after my husband and I made our first research trip to Australia, I received the news that the boat had been purchased by an a group of wooden boat and local history enthusiasts, backed by an eco-tourism company of Bruny Island, Tasmania. The restoration of this historical boat will, they feel, be a way of bringing attention to Dibbern’s life and philosophy, so applicable to these challenging times. The progress of this new adventure will be recorded in the Restoration segment of this site. The “George story” seems to be never-ending, and new findings continue to appear. In the early years of my research, there was nothing about “Dibbern” on line — except for fine bone china. That has changed substantially and thanks to the generosity of people who have known him and have sent memorabilia as well as anecdotes, newspaper clippings and photographs, the Dibbern collection continues to grow. It will be up to the Dibbern families to decide where the collection will ultimately be housed, but in the meantime, for anything you might want to know about George Dibbern, this is the place to visit. May 14, 2018 — New Look and New News ! I just wanted to tell you that I am in the midst of reading, Dark Sun and which I am enjoying very much. You have a lively writing style that keeps the story of this amazing man moving right along. I’m up to page 100 and it’s obvious that you have a talent for story telling and placing the reader firmly into the scene which is what every writer strives for but doesn’t always achieve. It really moves along. I actually cried at the end. I have completed reading my way through the long saga, and felt, at the last page, that I had departed from a journey with friends. It is certainly a monumental story, very well-researched and written. I’m no expert but I know what I like, and your book was a great read for me; I was sorry when it ended. Good on you for writing an excellent, thought provoking book. I have now finished the book, but find it filling my thoughts at odd moments and I may even begin again! It was just so sad that he never saw his German family ever again, I can’t believe the children did not travel out to see him. You have written a fascinating chronicle of a remarkable man. I’m sure it was an odyssey to complete the book as much as his life was and odyssey!!! I enjoyed your biography of him all the more so because he comes from the Kiel area, my birthplace. The quote on page 226, when he talks of the calm after the storm in very spritual terms, is the kind of thinking that apppeals to me. I have just finished reading Dark Sun which greatly impressed me. I agree with the statement on the book’s “monumental challenge” to write the George Dibbern story. You are to be congratulated. I really enjoyed the book. I never knew about the post-war hardship in Germany. I’ll spread the word about Dark Sun. Ich habe es viel zu schnell gelesen, es ist spannend wie ein Kriminalroman. Ich habe ungeheuren respekt für Ihre Arbeit. Man meint, Sie seien dabei gewesen. […] Insgesamt zu Ihrem Buch denkt man manchmal, eine Art Kommentar oder Bewertung fehlt. Anderseits haben Sie ja durch das ganze Buch kurze oft weise Bemärkungen und Erklärungen gestreut. So treffend auch die überschriften der Kapital! Das sagt eigentlich genug und der Leser ist frei, selbst zu urteilen. Von meiner deutschen Sicht aus wünschte ich mir noch, dass der Kontrast zwischen Nazideutschland und Dibbern beschrieben sein sollte. Hier die perfide und mörderische Barbarei, der Verlust alle Humanität und dort ein wahrer Mensch. Welch ein Lichtblick für uns Deutsche! Dass Sie diese Arbeit auf sich genommen haben, ist bewundernswert. Lassen Sie mich Dank sagen. Ohne Auftrag zwar aber doch im Namen aller Deutschen die unter der Erinnerung unserer schrecklchen Geschichte leiden. Dibbern ist – bei alle Unzulänglichkeit – Balsam für die deutsche Seele. Vielleicht dauert es noch eine Generation, bis er hier die gebührende Ehre erhält. Oder das Wunder geschieht, dank Ihre Arbeit. Vielen Dank dafür! (referring to the reaction of a friend) [She was] upset—almost to the point of violence—at George’s neglect of his wife and family. She felt the family had a much harder time of it than George had. An outstanding story, but not particularly happy. I haven’t yet finished reading Dark Sun (in fact I am barely ½ way through), however, I have to tell you what a fantastic job you have done with it. The way you have woven all the information you have gleaned into such a readable and enjoyable narrative, I find truly amazing. And when I think of all the time and energy (to say nothing of the expenses involved) that you and your husband went to in order to obtain the source material you did, I am, to put it mildly, awed. I dropped in [to the Squirrel Cove Craft Co-op] to say how much I am enjoying Dark Sun. What a tremendous job you have done. I do feel I know George Dibbern and would have appreciated him. I am going to try to find a copy of Quest as I am still not absolutely clear on what he termed his philosophy, and maybe it wasn’t altogether consistant or even coherent, though the basics of individual human freedom and the goal to be a citizen of the world are in my view admirable if virtually impossible to achieve. It is frustrating to watch freedoms being whittled away as security diminishes, and yet how can it be otherwise with the sheer growth of human numbers and complexity of technology. Yes, I share many of George’s frustrations! Perhaps my greatest frustration is watching the environment going down under a relentless onslaught of excess. Suffice it to say, this book provides lots of food for thought. A man of his turbulent times, Dibbern was also ahead of ours perhaps. I just wanted to convey how inspirational your book and subject were to me. I am sure there have been many remote spectators like myself who feel the same. I have just finished reading Dark Sun and must let you know how much I enjoyed it. I find George fascinating but still cannot make up my mind whether he is a selfish escapist or some one to be admired for his determination to stick to his ideals! I wonder what would have happened if he had not been befriended by Henry Miller. The amount of research you did was enormous and I can see how it took you 10 years. …just to say I am really enjoying your book on George’s life. I am on the last few chapters and now slowing down because I don’t want to finish! Whenever I really enjoy a book I find I do this. What a brilliant thing to do, without your book I would never have known him. Thanks again for a superb book. Your writing style is so invitational and readable. I’m no author, as such, but as a story songwriter I know the importance of character development. Even though you’ve written a biography with the story laid out in front of you and already know the beginning, middle, and end, it’s no easy task, I would think, to sustain the reader’s dramatic interest. There is a tone that you sustain that makes it sound like a tale of adventure of the mythic variety—which, of course, it is! Page 169 I could read over and over and over again. It reflects some of my deepest inner longings and intentions. I need to repeat the following quote many times each day as a reminder of who/what I am/want to be about: “…now that I have found what is my work, to work at something else I feel would be wrong.” Heart surgery or no heart surgery, I’m still a troubadour for as long as I can be. Thanks for the reminder, George. I believe this story intersects the lives of all of us in more ways than one. Believe me, my husband’s not a reader – and he couldn’t put Dark Sun down! I wanted to let you know that I am enjoying Dark Sun immensely. It’s nice to know that many were helpful and enthusiastic people as you gathered information for the book. That was great. I read the first seven chapters while on vacation. I am not a fast reader as I tend to savor the thoughts and inspirations that I come upon in good books. […] It’s wonderful to have this story of George especially his life before and after Quest. It is hard to comprehend leaving a family behind but in the context of what was happening in Germany and in his life at the time, it is a bit more understandable to me now. … I loved the photos and the amount of work you put into the book is obvious.